Be the first to share your favorite memory, photo or story of Cassandra. This memorial page is dedicated for family, friends and future generations to celebrate the life of their loved one. 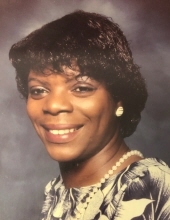 Mrs. Cassandra L. Willingham, 57, of Fairburn, passed away on Friday, February 1, 2019. Celebration of Life Service will be held on Friday, February 8, 2019 at 11:00 a.m. at St Mark United Methodist Church, 85 Bay St. Fairburn, GA.
Public viewing will be held on Thursday, February 7, 2019 from 1 p.m. until 5 p.m. at F. L. Sims Funeral Home, 2968 East Point St. East Point. Interment Floral Hills Cemetery, Palmetto. F.L. Sims Funeral Home East Point is entrusted. To send flowers or a remembrance gift to the family of Cassandra L. Willingham, please visit our Tribute Store. "Email Address" would like to share the life celebration of Cassandra L. Willingham. Click on the "link" to go to share a favorite memory or leave a condolence message for the family.